Winnow is a B Corp. What does that mean? Home / Blog / Winnow is a B Corp. What does that mean? Winnow is a Certified B Corporation. I only found out Winnow is a Bcorp when I asked if I could write an article for them. I knew they were rather successful, I used to share a co working space with them and watched them outgrow it, I heard of their funding rounds, and saw them in the press as they were featured on the BBC, showcasing how commercial kitchens can use technology to cut food waste in half. Winnow enables restaurants and other large catering facilities to intelligently reduce food waste. (The word Winnow derives from the ancient practice of Winnowing, the removal of wheat from chaff, separating the good from the bad.) Potentially halving waste is a lot like doubling profits for some establishments, or even making the difference between profit and loss. It also benefits everyone else sharing the same planet. Consider the effort that goes into food production. It’s massive, from the fertilisers and pesticides, the actual farming labour, the agricultural machinery, the water, the packaging of produce, the transport across countries and continents, the supplyline is huge. Reducing waste at the critical end point in this value chain can only be a good thing. This is one reason why I believe Winnow is so successful. Their business model is win win win. There are no losers in WinNow. There is no downside. Their customers save money and reduce food waste at scale. For hotel groups like AccorHotels and food halls in IKEA this has a non-trivial impact. The way it's implemented, the kitchen staff being involved in the process, is also empowering. 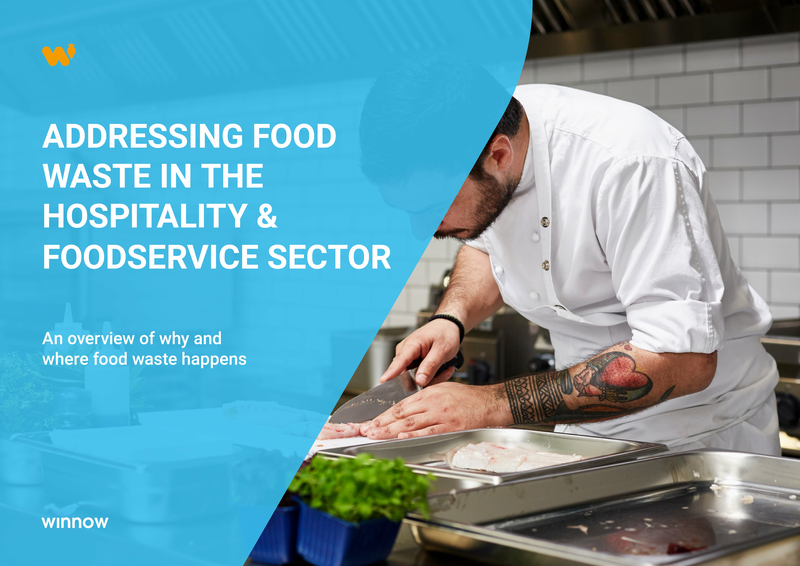 It brings employees into awareness of the financial aspect of their roles as caterers, each item disposed of displays a cost. And the intelligence gathered can easily be translated into changes in menu, or portion sizes, which enable further efficiencies which further benefit both the establishment and the customers. So, back to Winnows BCorp status. To quote the body that runs the accreditation process. "Certified B Corporations are leading a global movement to redefine success in business." I’ve heard the process of becoming a BCorp being politely described as ‘reassuringly rigorous’. To contextualize, it’s like being certified organic, or fair trade, but for the entire company. It’s a statement of intent, to combine profitability and commercial acumen with taking responsibility for doing so in a way that actually benefits the World. “B Corps are for-profit companies certified by the nonprofit B Lab to meet rigorous standards of social and environmental performance,accountability, and transparency.” They are assessed on Environment, Workers, Customers, Community and Governance. According to bcorporation.uk, there’s slightly more than 2500 accredited BCorps Globally. Some are major, Innocent Drinks is one, Danone UK another. In a recent radio interview with Evan Davis on the BBC the representative from Danone spoke about his intention for the entire Global Danone group to become a BCorp. It’s a seismic shift in business mentality. It has a legal implication, BCorps amend their articles of association to give a wider remit than shareholder returns. It’s not just greenwashing, it’s an authentic movement, one that values people, the environment, humanity, as well as profitable returns for shareholders. It’s about people using business as a force for good. Winnow is one of just 145 UK Bcorps, certifying in March 2017, although that number is absolutely on the increase as the movement gains traction. Investors and customers deserve to know, and should be reassured to know, of this accreditation, and what it means. Surely companies that take the time, expense, and effort to be awarded BCorp status are inherently Better in nature. In my role as a journalist and publisher in the tech and finance sectors, I've seen literally hundreds of startups come and go. Bcorps are likely to be much more stable, far more likely to succeed, and to pay better dividends and see a higher return on investment. They are by design aligned with the increasing demands of the markets to make business a force for good. More power to them all. This article is one of 40 commissioned by P2P lender RebuildingSociety.com exploring better business. Authored by Bird Lovegod.